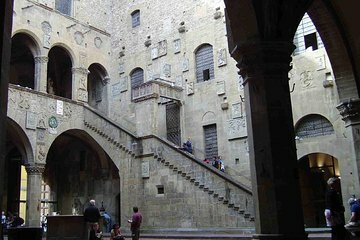 Join an expert guide for a 2-hour private tour of the Bargello Museum in Florence. See works by Michelangelo, Donatello, Della Robbia and more, while learning about the artwork and historic building from your own informative guide. Make your own way to the Bargello Museum to meet your guide for an in-depth experience of the collection. Learn about the building itself, which dates back to the mid 13th-century, and opened as a museum, Museo Nazionale del Bargello, in 1865. On the ground floor, see 16th-century Tuscan works including four masterpieces by Michelangelo. Check out intricate terracotta pieces by Andrea and Giovanni Della Robbia on the second floor of the museum. Other highlights include the impressive collection of gothic and Renaissance Italian sculptures that span from the 14–17th centuries, including works by Bandinelli, Cellini, and Donatello.